A clear-complexion and healthy, radiant skin is the aspiration of most women, especially for those who suffer from skin disorders such as Acne. 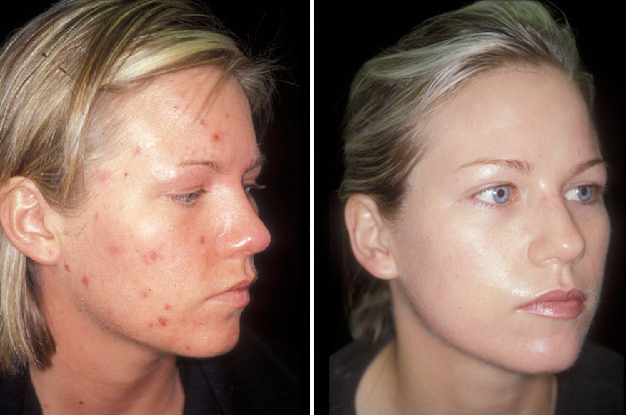 Unfortunately, Acne can’t be cured, but it can be controlled with treatment. The Objective of Acne treatment is to reduce or clear up the spots through skin care or by treatments to inhibit sebum, limit bacterial growth, encourage the shedding of skin cells and the unclogging of pores. Acne is a skin condition that consists of spots or painful bumps on the skin. It is most noticeable on the face, but can occur on the back, shoulders and buttocks and severe Acne can cause scarring. Acne is mainly caused by the way the skin reacts to hormonal changes, like during puberty, and in women, before a menstrual period and sometimes prior to the menopause. The skin contains sebaceous glands that naturally release sebum, an oily substance that helps protect the skin. During puberty, for example, the raised levels of the hormone testosterone can cause too much sebum to be produced. The sebum can block hair follicles and when dead skin cells mix with the blockage, it can plug the opening of the pore which in turn causes the hair follicle beneath to swell. Bacteria in the skin then multiply creating a swelling beneath the blockage and this leads to the formation of spots. Painful or inflammatory Acne needs to be treated early to help prevent scarring. Treatment for Acne depends on how severe it is and it can take several months of treatment before the symptoms of Acne improve. There are many Over-the-counter remedies for mild Acne such as Anti-biological or Vitamin A creams or gels. Your General Practitioner can proscribe Antibiotic medicines, but these can only be used for up to 6 months and the side effects can include becoming resistant to antibiotics. Other side effects may include making your skin more sensitive to sunlight or making contraceptive pills less effective and may also cause nausea. We at Aesthetics of Essex provide a comprehensive treatment for Acne using the award-winning Glo Therapeutics skincare product range. These advanced formulations work systematically to support your skin health and treat skin conditions. Glo Therapeutics products include cleaners, toners, moisturisers, serums and specialty treatment formulations that are based on established research and cutting-edge science. Glo Therapeutics delivers personalised and professional skincare solutions by incorporating daily regimens with targeted treatments. Utilising innovative technology our formulas are designed with potent concentrations of active ingredients to clinically transform your skin. These products are not available on the UK high street. Breakouts of Acne can have a life-span of 2-4 weeks. A Glo-Therapeutics skin care regimen at Aesthetics of Essex can help treat blemishes and prevent future breakouts. In as little as eight weeks, you will see improved clarity and radiance. The Daily System is a regimen of morning and evening treatments to purify and control breakouts. Step 1: Clear Acne Cleanser – Contains scrubbing beads to gently clear the skin’s surface and allow for optimum Salicylic Acid penetration. Contains 2% Salicylic Acid, Scrubbing Beads, Apple Enzyme. Step 2: Purifying Tonic Toner – Balances, calms and purifies skin with antibacterial and antioxidant activities. Contains Totarol, Bisabolol, Blue Agave. Step 3: Clear Complexion Pads (optional) – Gently breaks down excess sebum, immediately balancing oily skin and helping prevent the growth of acne-causing bacteria. Contains Salicylic Acid, Citric Acid, Spearmint. Step 4: Oil Control Emulsion Moisturiser – Balances combination skin with a lightweight blend of humectants, antibacterial agents and antioxidants. Contains Totarol, Allantoin, Hyaluronic Acid. Step 5: Oil Free SPF 40+ Daily Sunscreen – Provides broad-spectrum protection from the sun’s damaging rays while nourishing hydrators and antioxidants fortify the skin. Contains Zinc Oxide, Octinoxate, Octisalate. At Aesthetics of Essex we use Glo Therapeutics’ range of Glo-Minerals Makeup, at our clinic. Recommended by dermatologists & leading skincare professionals worldwide – Glo-Minerals Makeup is clinically formulated to protect, correct & cover – resulting in radiantly beautiful skin, cheeks, eyes and lips. Glo-Minerals have a powerful antioxidant blend of Vitamins A,C,E and Green Tea Extract. On your skin this blend provides nutrients that are vital for maintaining the health of your skin while protecting from further damage.